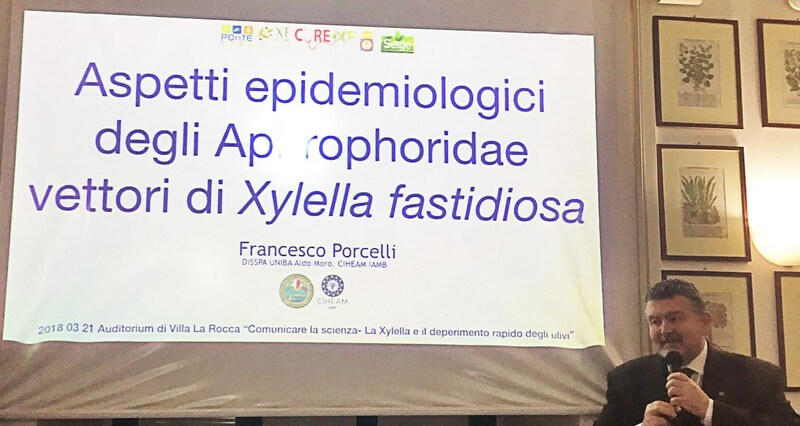 More than 60 people among researchers, stakeholders and local authorities attended a seminar held in Bari (Italy) to enlarge the knowledge on the research outcomes and latest information available on Xylella fastidiosa. 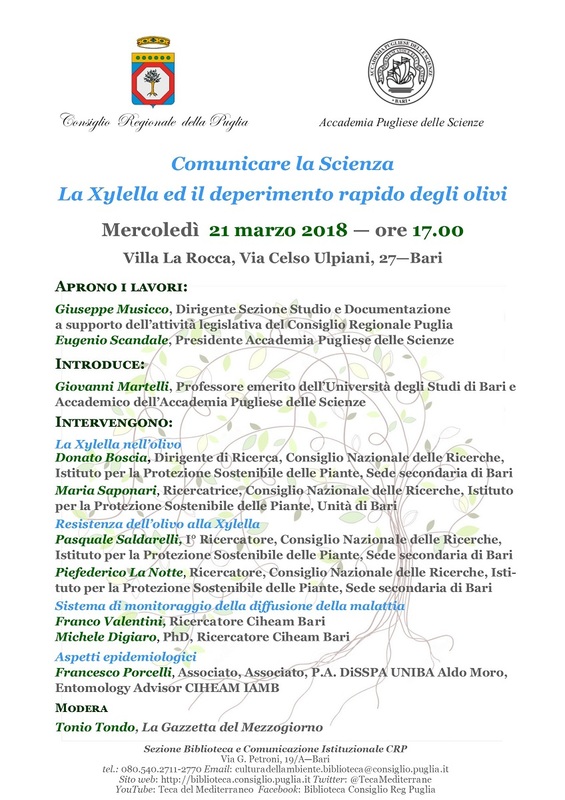 On Wednesday, March 21, the seminar “Communicating science: Xylella and the quick decline olive syndrome” took place in Bari with the aim to disseminate the most recent scientific knowledge on the bacterium Xylella fastidiosa and the decline syndrome affecting olives in the region of Apulia. 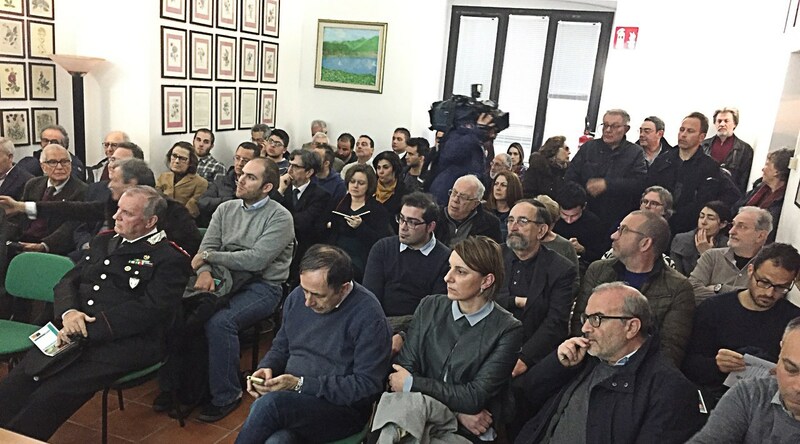 Co-organized by the Apulian Regional Council (Sezione Biblioteca e Comunicazione Istituzionale) and the Academy of Sciences of Apulia the event was attended by more than 60 participants. 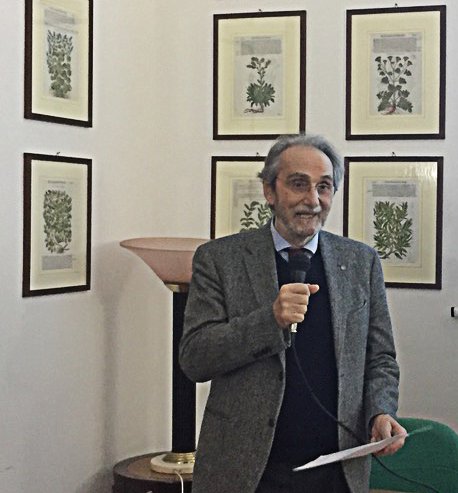 The scientific program was opened with an introductory speech by Prof. Giovanni Martelli, a renowned plant virologist and Professor emeritus at the University of Bari. 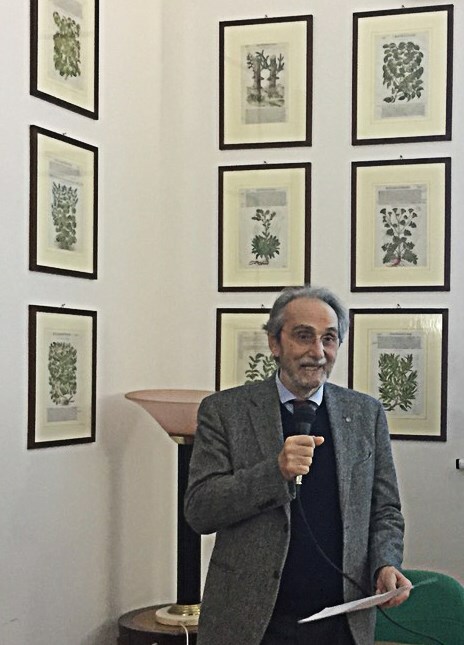 He illustrated the general features of this emerging pathogen, followed by a presentation documenting the evolution and the current spread of the infections in Apulia. Maria Saponari, coordinator of the EU-funded project XF-ACTORS, international consortium of 29 partners including the major European research centres, provided an overview of the major outcomes obtained so far by the ongoing research programs (a technical report issued recently is available here). Advances were presented on the genetics, biology, vectors and diagnosis of the bacterium. 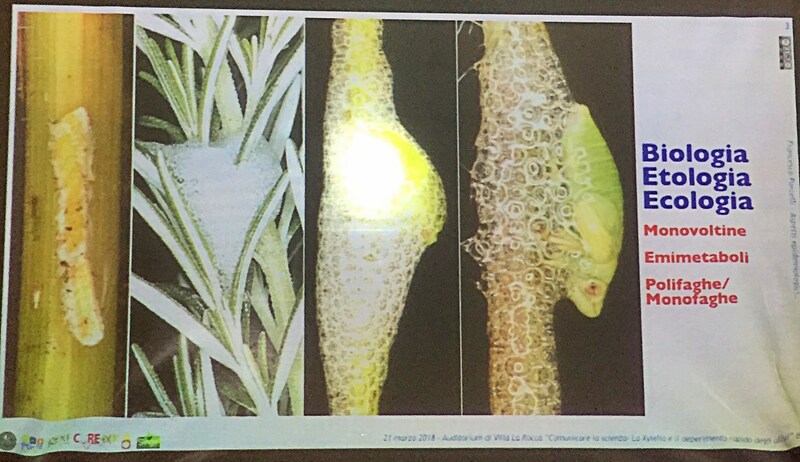 However, tools and strategy for the control of the diseases caused by Xylella will require long-term research programs before to delivering practical outcomes. More aspects of the research activities and actions taken against the spread of the bacterium were explained by the other speakers: Donato Boscia, coordinator of the EU-funded POnTE project, Pasquale Saldarelli and Pierfederico La Notte, researchers at IPSP-CNR, Michele Digiaro and Franco Valentini, researchers at Ciheam Bari and Francesco Porcelli, professor of entomology at the University of Bari. 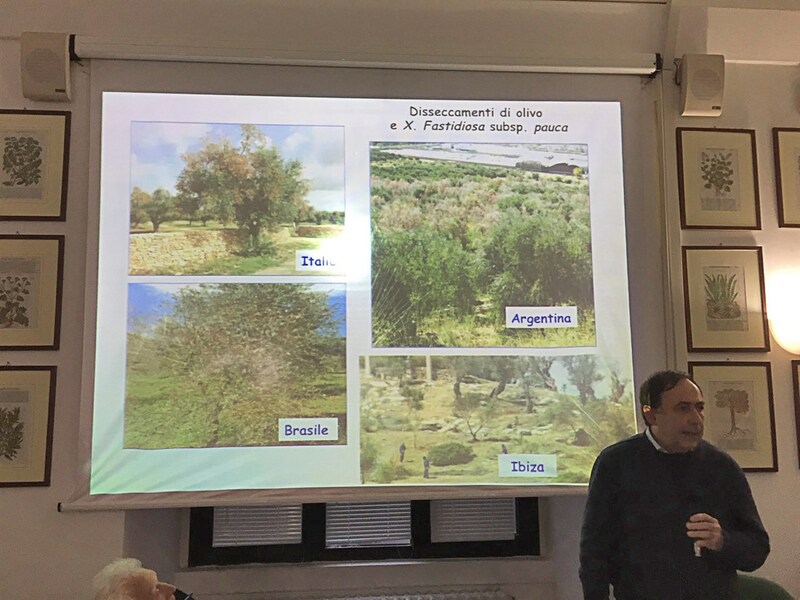 Among the different topics addressed, the presentations stressed a common aspect: the high level of scientific collaborations and stakeholders interactions established at European level on the topic of Xylella fastidiosa. This important point will increasingly facilitate the achievement of ambitious scientific advances and substantially contribute to create the conditions to mitigate the severe economic losses and social impacts caused by the spread of this harmful pathogen.